Yep, it was official. We were welcoming a new pup into our family, and we named him Duke. My husband had seen an ad in the paper from a guy whose dog accidentally got pregnant by his friend’s dog, and he was looking to adopt out the puppies. 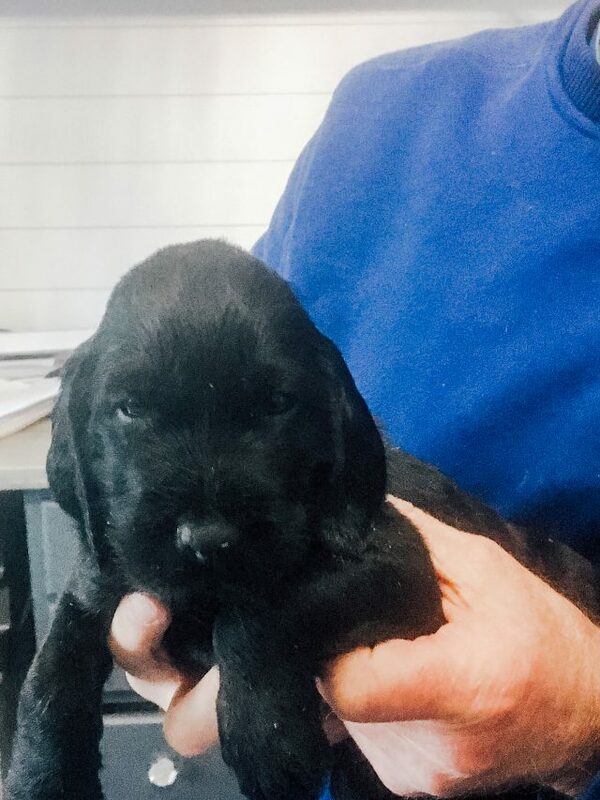 My husband had called, visited, and picked out Duke before I even knew we were getting a puppy. So sweet, right? He definitely is going to have a lot to follow-up to next Christmas. We already had two pups, Emma and Ted. And somehow we’d convinced ourselves that puppy training and potty training were going to be sooo easy. With Ted, it was a breeze to potty train him, but with Duke it was a whole other story. We got Duke when he was just 6 weeks old, so he had a lot of growing and learning to do before he was ready to potty train. 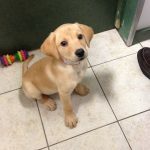 Most puppies get adopted out around 12 weeks. so little Duke was a little too young to start. 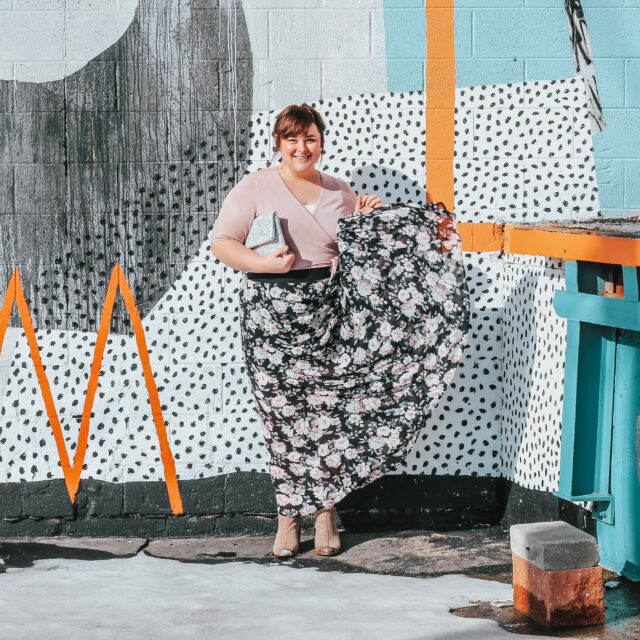 My fear was if I started too early, he wouldn’t be able to handle it and would get discouraged. So we waited a bit and started when he was 12 weeks. Needless to say, there were lots of accidents in his puppy pen. 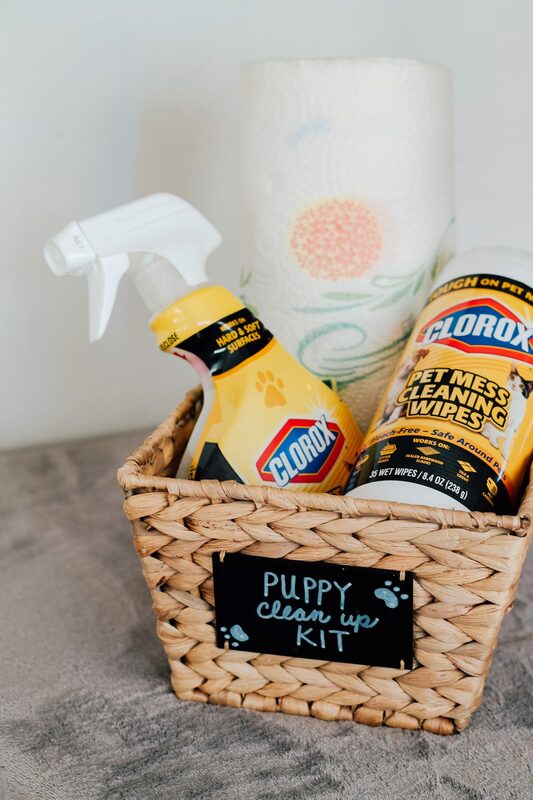 But we were equipped with a puppy clean-up kit, so we had everything we needed to clean up any messes and keep Duke’s environment both clean and positive. I picked up from Walmart. 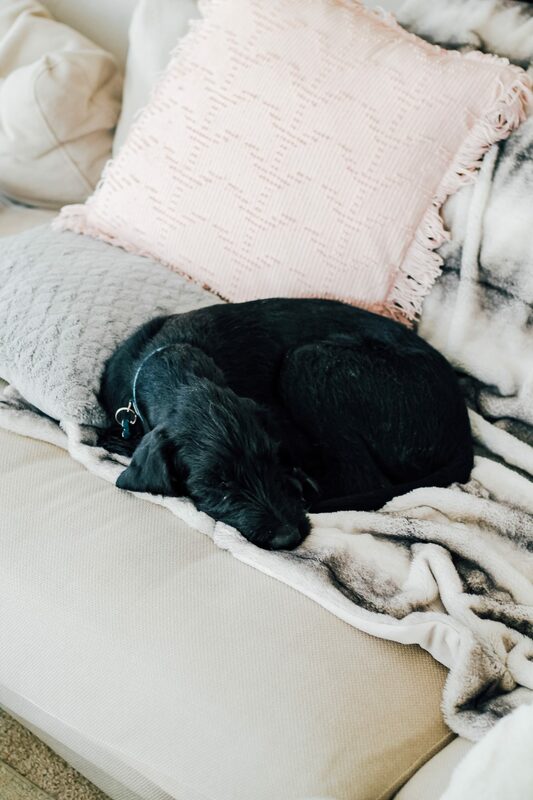 I love these products because they’re bleach-free and safe to use around pets. 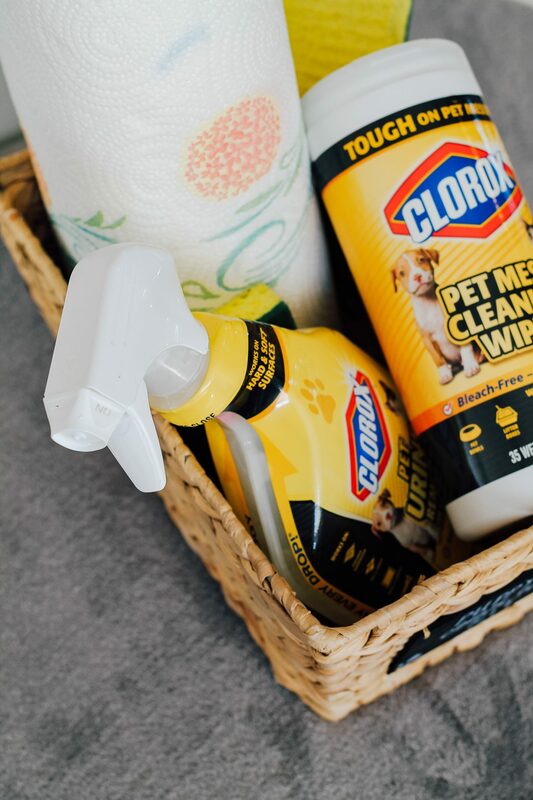 The 24-ounce spray bottle of Clorox Pet Urine Remover has Smart Tube Technology that guarantees you will spray every drop. The spray removes both urine stains and odors from multiple surfaces from upholstered furniture to tile or hardwood. 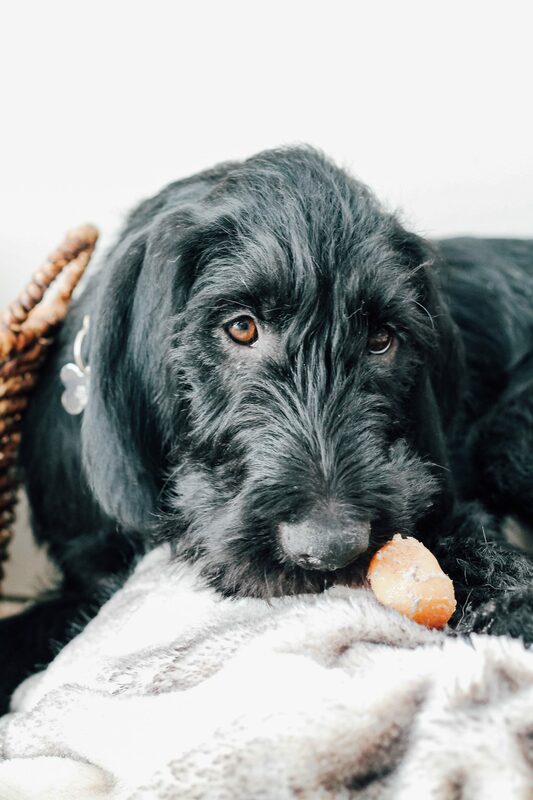 The Pet Mess Cleaning Wipes are bleach free, fragrance free, and made with plant based cleaning agents and a clear drying formula so you won’t worry about harsh chemical smells or residue around sensitive noses and surfaces. 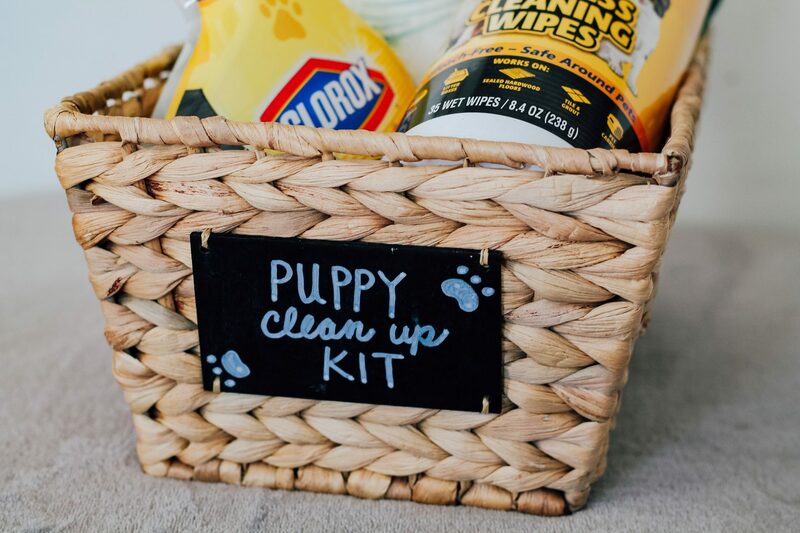 If you’ve just gotten a puppy or are getting one soon, take note of the items in the Puppy Clean-Up Kit below so you’ll be well prepared for any messes! Paper Towels – Perfect for wiping up bigger messes to dry area, then wipe clean with a Clorox Pet Mess Cleaning Wipe. 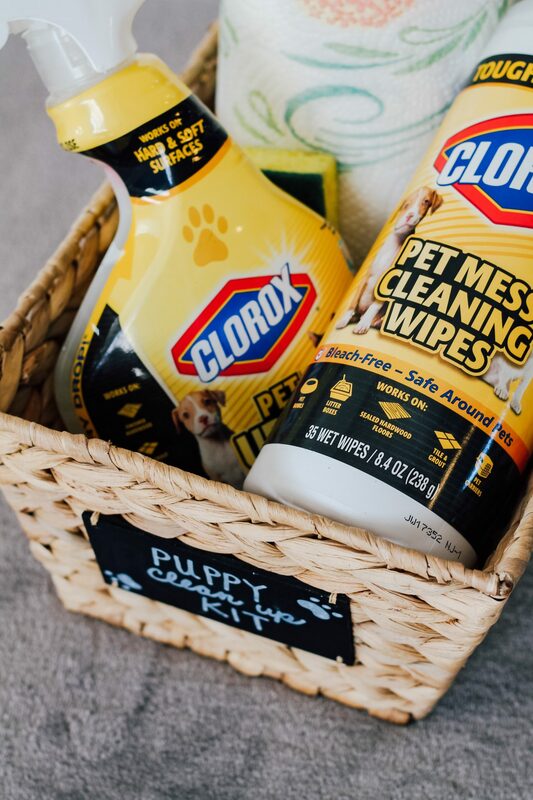 Clorox Pet Mess Cleaning Wipes – Perfect for any surface and cleaning any mess! Safe to use around pets. Clorox Pet Urine Remover – Great for messes on floors or other surfaces. Contains no bleach, safe to use around pets. Potty Pads – These are great to have on hand in case you’re still potty training and/or your puppy is too young to potty train. Potty Pads are a great training tool and one that we used with Duke! 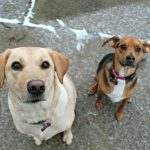 Potty Training Spray – Want your pup to go potty in a specific spot outside? This spray is great for directing them to the right spot with ease. Ready to see what Duke looks like at 16 weeks? He’s much BIGGER now, and his beard has really grown in nicely! Duke is *very* close to being fully potty trained and is making great progress! 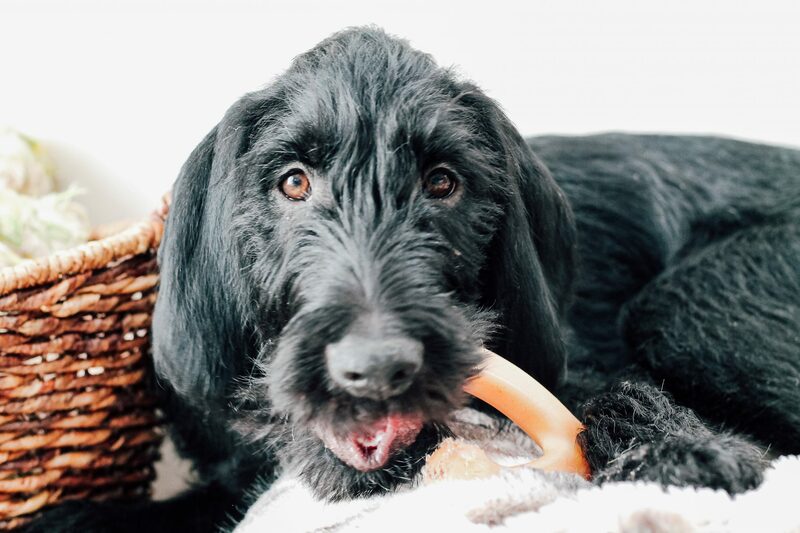 Like any other pup, Duke is energetic and requires lots of exercise, he absolutely LOVES being outside with Emma and Ted so we make sure he gets lots of outdoor time each day. I work from home so it’s easy for me to let him in and out throughout the day. 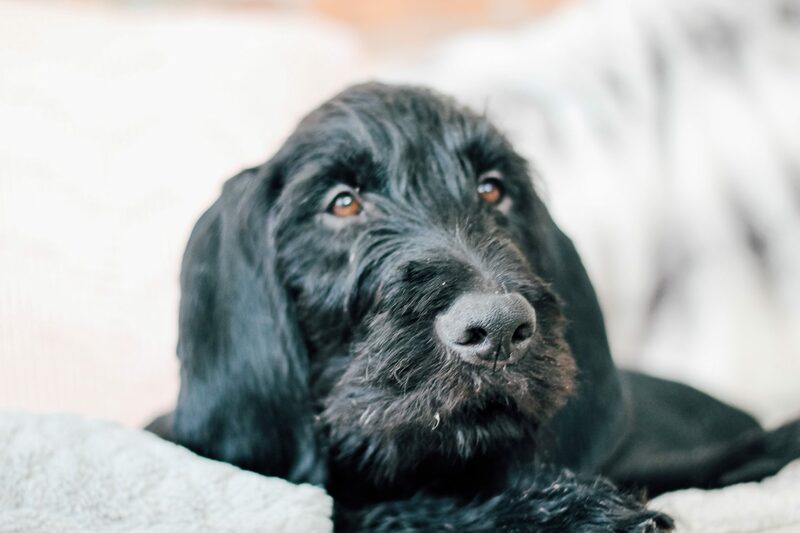 Occasionally he’ll still have an accident, but I have our Puppy Clean-Up Kit right on our kitchen counter so it’s always ready should a mess arise. 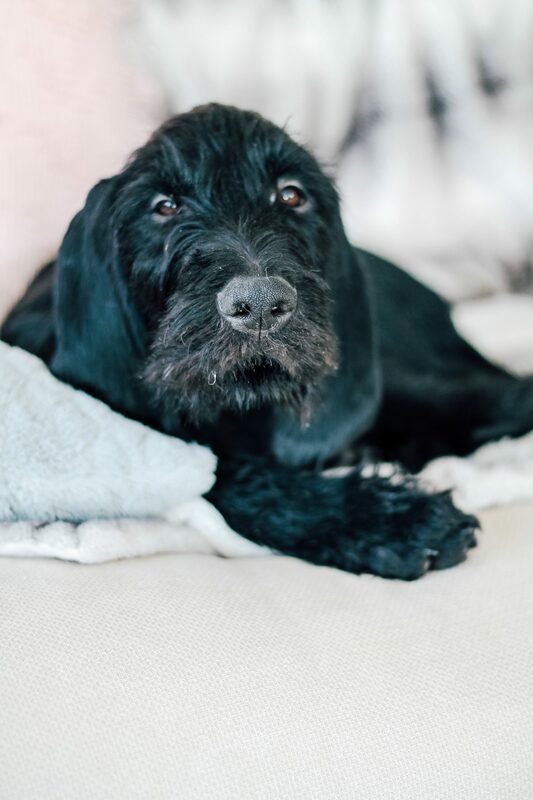 Just look at those eyes (and that beard), isn’t he adorable? 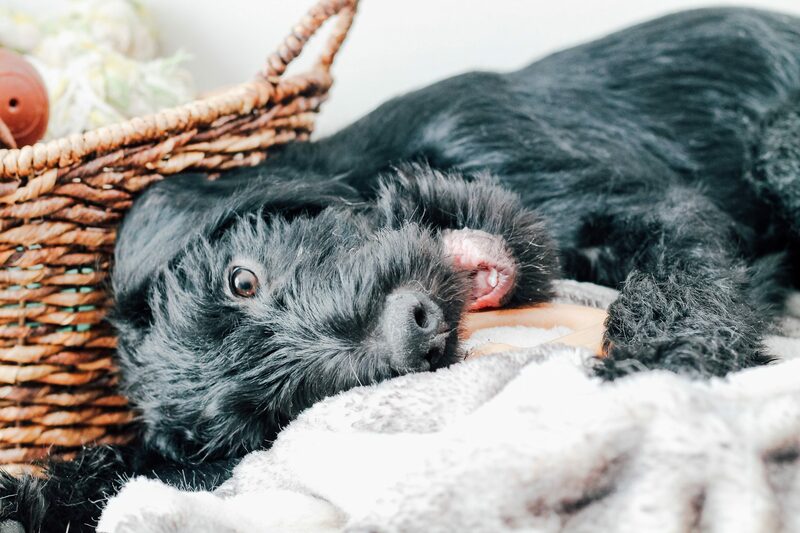 Potty training a puppy is HARD and requires lots of patience, but if you’re prepared and aware of that ahead of time, it will make things a lot easier on both you and your new puppy. It’s easy to get frustrated or overwhelmed during the process but just know that the more they practice, the more you assist them, and the longer they do it, the more they’ll get the hang of it and the easier it will be. 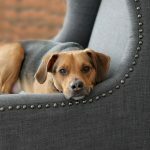 Take it from a gal who has three dogs, it is possible to potty train your pup – but you need to keep in mind that every pup is different. When we first got Duke, it was unfair of me to compare how he potty trained to how Ted potty trained because they’re two different dogs with two different personalities, and having the expectation that Duke would pick it up as fast as Ted was unrealistic and just caused us both more stress. My favorite part about Duke (so far) is his sweetness. He loves to snuggle, loves to give kisses, and loves to play with the boys. He has a fun and energetic spirit and is the loudest dog I’ve ever met. 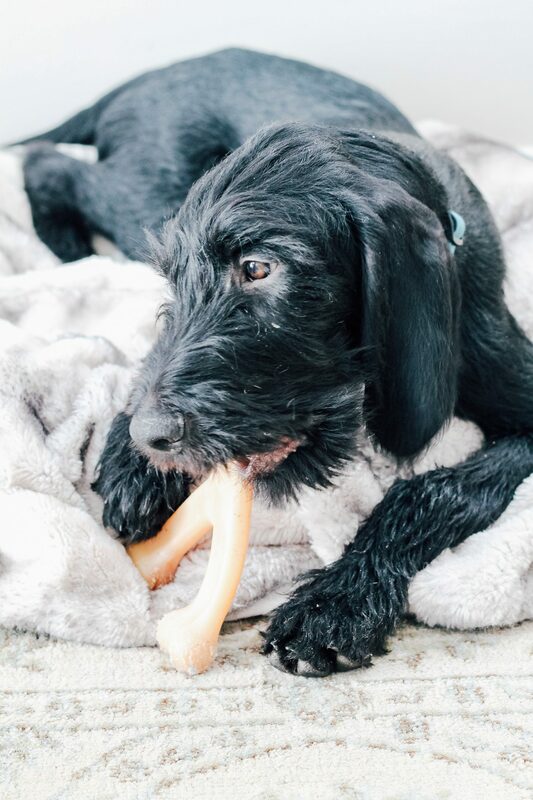 The first few weeks were definitely stressful, we had to put in a lot of time to get him used to his new home, new people, and other animals – but now that he’s settled in he’s doing just great! 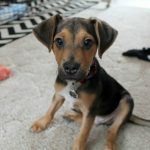 There really is no better feeling than adopting a pup, bringing them home, and seeing them thrive. We sure are lucky to have found this sweet pup, and now I couldn’t imagine our lives without him. BEST Christmas present, ever! 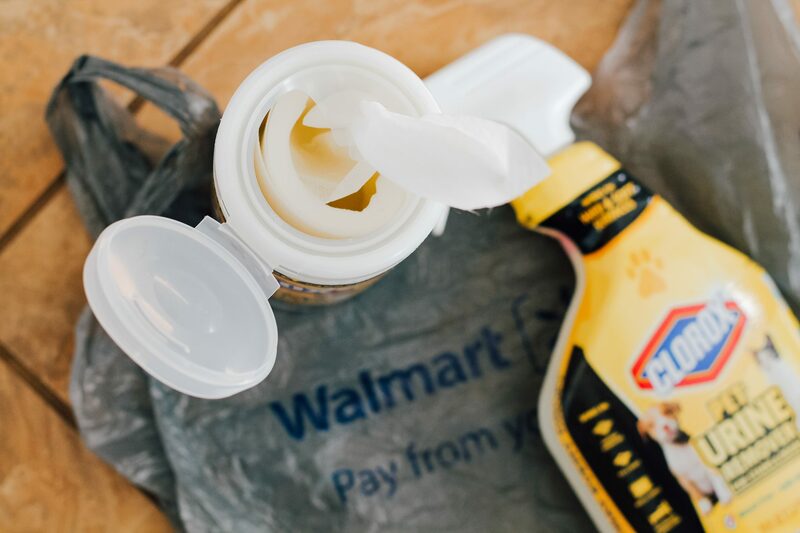 If you’re getting a puppy, don’t forget to head to Walmart to stock up on all the puppy cleaning supplies you’ll need so you can be prepared. 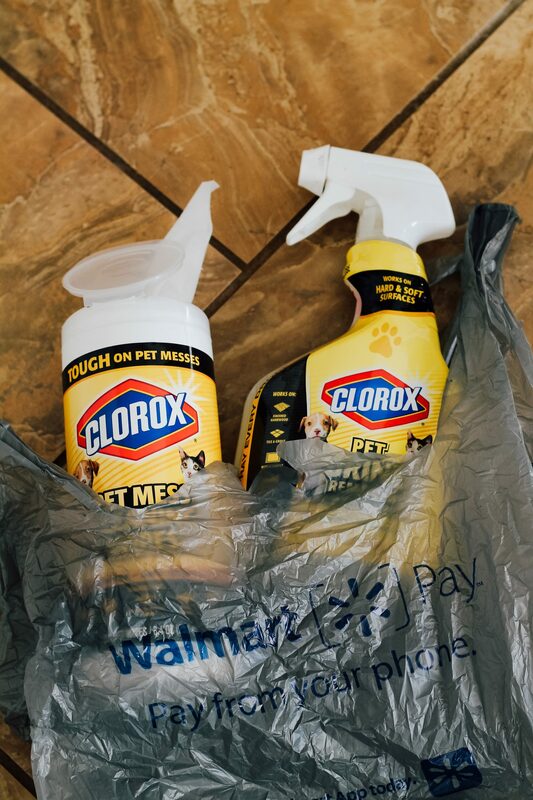 Be sure to grab both Clorox Pet Mess Cleaning Wipes and the Clorox Pet Urine Remover, you can find both right in the pet aisle at Walmart!